I have not written a blog in more than a week. First I was leaving Los Angeles to go back to Holy Apostles College and Seminary in Connecticut where I teach. Then, I had no sooner unpacked and finished my errands when Hurricane Irene hit. Fr. Dennis Kolinski, one of our priests from the John Cantius Society whose seminarians study here, remarked just before the storm “It’s good. It shows us that we are not in control.” I didn’t like hearing that at all! The fear of the storm reminded me of news photos of people being lifted off their roofs into helicopters during Katrina in New Orleans. That was a moving image of loving compassion, but I certainly didn’t want to be the protagonist victim of such a scenario. It was also going to be different than earthquakes of the past where I was protected by family. Yes, there are more than a hundred strong men here at the seminary, but none of them would be in my room when the predicted 80 mile an hour winds would keep me trapped inside! I happen to live in a “cell” within a large house, but my room is the only one facing out with no halls connecting me to the others whose masculine quarters constitute a semi-cloister. It felt awful being the only quaking female amongst all these stalwart men who pride themselves on fearlessness! The other women living on campus are 12 Vietnamese nuns all together in a separate house. 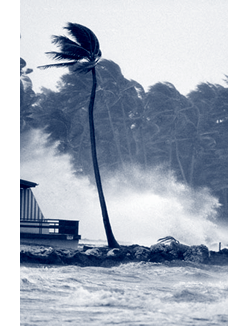 Whether by grace or nature, the hurricane dwindled to a tropical storm by the time it hit at 6 AM Sunday morning. No one was hurt, power outages mostly took out the net connections but not the lights. I kept reminding myself of my own teaching that the proof that for anyone “God alone is enough” is that we are not disturbed by earthly occurrences! Humbling, therefore, to have to see how fearful I could be! The rector had all able-bodied seminarians of all ages and nationalities drag off the branches from the fallen trees, which, apparently saved us $10,000 it would have cost to hire professionals! Today, after 3 1/2 days, the net is up and I can write blogs again. A good result is that I will never be surprised when I hear of good Catholics being fearful or angry when threatened by or in natural disasters!